Just when I think about how difficult it feels at times to set up life in a new place, I get a reminder that we have a head start on settling that so many don't have. At least we are in our own familiar country, where people speak in languages we understand (mostly) and every step we take is not a struggle to survive and fit in. My youngest daughter goes to daycare part-time at the local association for newcomers, where she stands out as a newcomer of a different sort, an Anglo-Saxon Canadian newcomer. Let's just say she glows there. It was her idea. She was bored at home with me in the afternoons, so she said, and wanted to play with other children. The other kids are from many different parts of the world, and we both love that. She talks about her friends from Saudi Arabia, Africa and other countries she didn't even know existed before. Today we saw a woman sitting, her face turned toward the window, her beautifully-embroidered clothes covering all but her sandalled feet. Her head, fashionably wrapped in a hijab, rested on her hand, and she sat silently, just looking out at the strange prairie city outside. When I left, she was still there. I could not help but wonder what was going through her mind. I hear many conversations in many different languages here, and I hear translators trying to explain to settlement workers what the newcomers are saying, what problems they are facing and asking what to do about it. It puts our whole life into perspective, truly. We may have some (ahem, political) problems in this country, but all in all we have it pretty darn good and no one can tell me otherwise. How does one make a home in a country that is so strange and alien, when that person has run from a life which we in Canada can not even imagine? So far from family and all they know, it must seem insurmountable. If I think it is tough to meet people and find some sense of belonging, what must she feel? One place I am looking for community (not to mention fresh veggies) is at the city's community garden, and interestingly enough, so are many immigrants. The organizer tells me that about one-third of all the gardeners in the city's large garden plots are in fact newcomers to Canada. It is a way for them to grow their own food, and specifically to grow food that is culturally appropriate for their families. What an idea! I love it. I have never needed to do community gardening before, as we have always had a big yard in which to putter. The garden is a fascinating place. Seniors and young families, newcomers to the city and newcomers to the country, all are there digging and weeding alongside one another. There are even raised platform gardens for those with mobility issues. It is the ultimate in inclusive gardening, where the experts can help the newbies, where you can share if you have too many zucchini and someone else too many green beans. Kids run free, gardeners discuss the weeding over their coffees in the morning. Twice during the growing season the gardeners hold farmers' markets selling their extra produce and baking, with the proceeds going to local charity. AND everyone is encouraged to grow an extra row of vegetables for the food bank. Fabulous, and also pretty timely considering all the talk these days about food security, eating local and the rising price of groceries. For a very small fee, we get a plot, rototilled and ready, a supply of water, and a shed full of every tool we could possibly need, from wheelbarrows to hoes, tomato cages to watering cans. It is the best deal in town, truly, because for newly-arrived city dwellers like us it becomes our yard, the place we go after school on a sunshiney afternoon. We weed and water and plant, pick some rhubarb out of the communal patch, watch the trains go by across the river and listen to the birds. The girls run around importantly checking their own little plots and playing with the toys that live in the gardens. We bring a picnic and enjoy the flower beds. It makes me wish that everyone who lives an urban lifestyle could have their own little patch of earth like this. 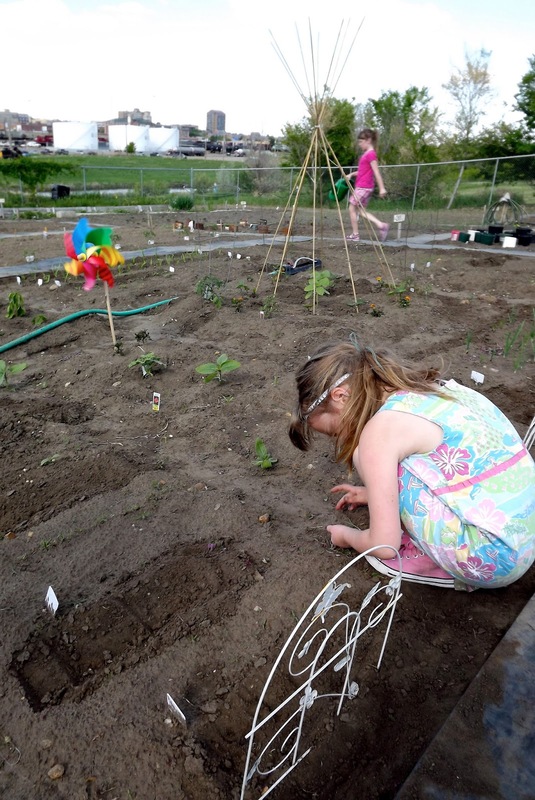 Just as Ava's daycare does for her, the garden helps connect us to others we might not normally know, and indeed gives a sense of being "settled" in a way that we wouldn't find otherwise. The bonus of fresh food grown by our own hands is just another fabulous perk. Great post, as usual, Stephenie. Maybe Ava will be a world traveller! I had the privilege of digging today to plant some perennials which I, no doubt, will forget the names of by next year. :) Made a delicious rhubarb crisp on the weekend. I think of you often.